Hawks are the #1 seed in the Eastern Conference Playoffs for the first time since 1993-1994. Hawks won the season series against the Wizards 3-1. Hawks made 10+ 3FGs in 5-of-6 games against the Nets. Against the Nets on May 1, Kyle Korver became the first player in NBA Playoff history to have 20 points, 8 rebounds, 4 assists, 3 steals, 1 block, and six 3FG made in one game. The Hawks entered Game 1 of their conference semifinal match with the same momentum and ferocity of Friday’s mashing of the Nets. Philips Arena was packed from top to bottom for the afternoon matchup. Scores of people could be seen all around in their “true believer” shirts. The city has truly embraced their storied club and attendance numbers have soared this year. 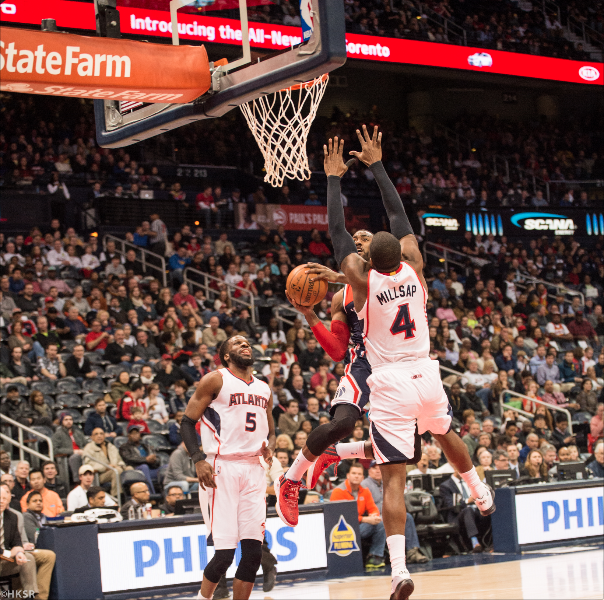 The Hawks were up by as many as 11 points against the Wizards. The 1st Half was huge for DeMarre Carroll, as he put up a monstrous 21 points and went 5 of 7 in 3-pt shooting. The Wizards brought in Paul Pierce for a series such as this one against a dominant team without a superstar; leaving no clue as to who may shoot the ball in crunch-time. He shot 2 of 6 in 3FGA and had 10 points. He played more of a leader and floor general than an impact player. He was exposed more than once by the Hawks’ youth and his age was exploited on numerous occasions. John Wall had a meager 6 points but put up 6 assists and looked to have injured his hamstring in the 1st Half. With the Hawks surging like they have been, the Wizards didn’t need any injury problems to further hinder their chances. But that moment came in the 3rd Quarter when Bradley Beal fell to floor. Both injuries were temporary and they returned to the floor (but you could tell they were fairly serious injuries). The 4th Quarter in particular was the most exciting of the game. The Wizards turned up the heat and took the lead late in the 3rd Quarter and never let go. The Hawks fought back with 2 minutes left and the Wizards had yet, another player go down; this time it was Paul Pierce. With 1:10 left to go in the game the score was 96-100, the Hawks were down by 4. They didn’t foul with time winding down and when they did, the Wizards were sure to make their free-throws. So the final score was Atlanta 98, Washington 104. The Hawks’ inability to finish strong is reminiscent of the Georgia Tech (Men’s Basketball) season we endured: Starting strong but finishing weak, which resulted in losses. With the exception of the 2nd Half, the Hawks played an excellent game this afternoon. But when you have your opponent down, you’re supposed to land the final blow to finish them off, not ease up and get comfortable because you’re leading. We hope they get things together for Game 2. We think they boys can turn it around and nab a win Tuesday, and steal an away win in Washington.